The United States Congress designated the Spring Basin Wilderness (map) in 2009 and it now has a total of 6,404 acres. All of this wilderness is located in Oregon and is managed by the Bureau of Land Management. Located just above the John Day River just south of state highway 218 near Clarno, Oregon, the Spring Basin Wilderness is a tapestry of rolling hills, providing spectacular vistas of the river and surrounding landscape. This unique wild area offers a profusion of desert wildflowers in the spring, along with recreational opportunities for hikers, horseback riders, hunters, botanists, and other outdoor enthusiasts. The Spring Basin Wilderness is dominated by big sagebrush, native bunchgrasses, and western juniper, providing important habitat and forage for native wildlife. Several natural fires in recent decades have burned, part of a natural cycle that helps control the spread of native juniper and rejuvenate native plant growth. Fire is an important physical process in a naturally dynamic system. Many non-native plants, including annual grasses such as medusahead rye and cheatgrass have spread into Spring Basin, particularly where there has been a lot of human disturbance. However, native bunchgrasses still cover most of the landscape, providing important habitat and forage for native wildlife. The wilderness provides habitat for a variety of wildlife, including lizards, snakes, bobcats, coyotes, cougar, mule deer, and elk. A large number of birds also frequent the area, including chukar, meadowlarks, bluebirds, and sharp-shinned hawks. Golden eagles and red-tailed hawks nest in the vicinity. The wilderness is named for a spring in the center of the area, which produces water year-round, a much needed oasis in the dry uplands. 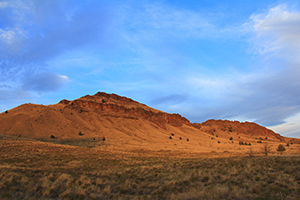 40 to 50 million years ago, a chain of volcanoes called the Clarno volcanoes stretched across northeastern Oregon. Multiple eruptions deposited layers of ash, lava, and volcanic mudflows called lahars. Many of the rock outcroppings in Spring Basin were formed by these lahars, which solidified as they cooled, trapping plants and animals and preserving them as fossils. From looking at these fossilized remains, scientists know that at the time the Clarno volcanoes were erupting, Spring Basin’s landscape was covered by a subtropical forest of palms and magnolias, where tiny four-toed horses and huge rhino-like brontotheres roamed. Planning to Visit the Spring Basin Wilderness? How to follow the seven standard Leave No Trace principles differs in different parts of the country (desert vs. Rocky Mountains). Click on any of the principles listed below to learn more about how they apply in the Spring Basin Wilderness.